When people think of pet bloggers they usually think of people blogging about dogs and cats, but you can find blogs about every type of pet- rabbits, parrots, guinea pigs, you name it. Erinn writes a blog about ferrets- Mustelamania. She is this year’s winner of the BlogPaws “Nose-to-Nose” Social Media Pet Blogging Award for Best Wiggle Blog. Congrats to Erinn! I’m 27 and live in Gloucester, Massachusetts. I have four ferrets: Tank, Mudflap, NB’s War Paint (Smudge) and NB’s Under the Radar (Banshee.) Smudge and Banshee are litter mates from a private breeder in Pennsylvania, while Tank and Mudflap are both rescues. Besides my fuzzies, I also share my home with two cats (Elsabet and Quinn,) three tortoises (Penelope, Henry, and Lyra,) a painted turtle (TT,) and my boyfriend, Sal. Right now I am also hand-raising a rescued baby tufted titmouse I stumbled upon in a cemetery. I have always loved animals, and growing up I had a variety of pets ranging from dogs, a cat, and many rabbits, hamsters and gerbils, to a lovebird and a box turtle. I was a very shy and socially inept child, so animals were my friends. The one pet I was never allowed to have, however, was a ferret, despite my fascination with them. I didn’t get my first ferret until I was 21. Since then, I’ve had 11 ferrets. I started Mustelamania because I was unemployed and trying to keep myself busy. My boyfriend suggested I start a blog about ferrets, and here we are! Specifically about ferrets: not long, I only started Mustelamania in March of this year. However, I’ve always kept a variety of poetry and short story writing blogs. Ferret news, fun, and love! Mustelamania is pretty straightforward in that it is about ferrets and their wild mustelid cousins, but because I am very interested in pet nutrition, I also write articles occasionally about the pet food industry. I also try to do some reviews of ferret-related items and goods, and post any interesting ferret-related news bits I find. I guess I’d recommend The Adventure’s of Smudge and Banshee (Dirty Girls!!) It encompasses how rotten my jills can be but how I love them wholeheartedly despite it, or maybe because of it. This year, I won the BlogPaws Nose-To-Nose Award for Best Wiggle Blog, and that definitely encouraged me to continue writing. I can’t say there has truly been a “hard” part to blogging – I started it for fun and that’s how I always view it. If I don’t want to write, I won’t, so my posts aren’t supremely regular, but I do try to update at least a couple times during the week. Because starting Mustelamania coincided with my late Schooner’s development, diagnosis, and eventual death of a squamous cell carcinoma, I blogged intimately about her and her story. It was a very cathartic process for me, and helped me come to terms with her diagnosis quickly, so that I could truly enjoy her last weeks and give her a sendoff fitting of her. Writing has always been a release for me, so in that way, blogging has been a wonderful way to keep my spirituality and emotions regulated. Don’t write if you don’t feel like writing. That completely goes against anything any writing workshop will tell you, but in my opinion, readers can tell when a writer isn’t feeling it. And why write if the topic isn’t interesting to you as a writer? Besides mustelamania.wordpress.com, Mustelamania has a Facebook: facebook.com/Mustelamania and is on Twitter: twitter.com/mustelidblues. Wonder about Erinn’s blog name? Check out this past Pet Pop Quiz for the answer. 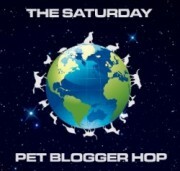 This post is part of the Saturday Pet Blogger Hop hosted by Life with Dogs, Two Little Cavaliers and Confessions of the Plume. Find more great pet blogs in the linky below. Just hoppin’ by to say “hi”. Thanks so much for stoppin’ by for a visit. I’m so glad y’all could make it! So nice to meet Erinn and learn something new about ferrets. A high school friend had one and I remember being amazed at the crazy places they could get into. The Dirty Girls story didn’t surprise me one bit. @somethingwagging Ferret proofing is a big ongoing task with these guys because they can wiggle anywhere.